My name is Toni Caserta-Khoury and the owner/operator of Catch Me If You K-9. I have been around animals all of my life. I grew up on a farm with horses, dogs, cats, cows and a few others. We were all in 4-H which meant we were responsible for our own animals. My love for animals started at a very young age. I learned to groom animals at a young age and it has always been a joy of mine. I can remember when we had a collie, it was my job to shed him out. So with a brush in hand I would sit on my front lawn and separate his coat to make sure I had all of loose hair removed. I continued with my first love of horses and became a horse trainer for 6 years. When I got married and had my daughter Samantha. I decided that working full time was not as important as being home for my family. 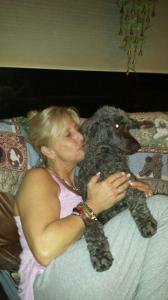 My mother always bred Poodles and of course I had learned how to groom. So I began my grooming career along with breeding Standard Chocolate Poodles. I will be the only one grooming your puppy! I do not groom mulitple dogs at one time. I would like to give you the comfort to know that your puppy is my main focus when I am grooming. I offer two locations in Lafayette, NJ and Randolph, NJ to bring your dog to my in home shops. Catch Me If You K-9 provides additional services such as home care and dog boarding. All pets receive one-on-one attention in a stress free environment.